Watching the Federated-Boeing building through his Fly-Spy drones, Sin watched two HRT teams exit the building and start actively sweeping the area for drones, 10-15 minutes after Murdoc’s astral investigations. He watched as they search for, located, and eliminated several other drones, but they never came close to his own, well-hidden drones. Back at the Pleiades Group office, the team decided that Prometheus would infiltrate the building the next day using the valid housekeeping ID Bookie had purchased. It was an infiltration method he had used before and he would raise the least amount of suspicion. Due to the building jammers, Prometheus would have to store the data on his person for later review by the others. There was some danger to this if Prometheus was caught, but the odds of him being caught were small. Near midnight, Sin watched the targets leave the building, each in their own chauffeured limousine. The cars arrived at the interior exit inside the parking garage shortly before each target left for the night. Combined with when the lights went off in the offices, this was reasonable confirmation that the targets worked in the identified offices. After the last one left, Sin went home. After that, the plan was put together [I’m compressing a lot of discussion here]. The best option appeared to be an air insertion onto the roof for the wetwork team, while Bookie would use the valid badge to walk in on the ground floor for a data grab, looking for juicy paydata. Bookie felt he’d have a better chance to sleaze around inside the host by accessing it directly. Sin contacted Kaylee, asking for rigged air transport for 4 passengers and stealth parachutes for the same [Killroy, Void, Murdoc, and Prometheus, while Sin would pilot remotely]. She asked if he needed to buy it or just borrow-and-return it and Sin confirmed he just wanted to borrow it. Kaylee called back later, confirming she had located an Ares Venture VTOL that Sin could access at 5:00 PM on the 27th, but he couldn’t launch until after sunset and had to be back before sunrise. Sin agreed to those terms and they worked out the details on picking up the vectored-thrust aircraft. Sin noticed that Kaylee never stated whether there was a price attached and expected to owe someone a significant favor after the run. 3:00 – Bookie will enter the building using the cleaning crew ID. He will locate an unused cube on the 3rd floor (there are many) and access the system, looking for paydata. 4:30 – After the security team shift change, Bookie will leave the building. 5:00 – The insertion team picks up the Ares Venture. Sin checks it over before use. 5:51 – The sun sets. 7:30 – The team takes off. Use access code to enter stairs. Make way down to 12th floor. Murdoc casts silence (R2-3), probably on himself. The attack happens, preferably attacking targets one at a time. After targets are down (assuming alarm has not gone off), Killroy to use katana to cut open exterior window for deployment of rappel line. Rappel to ground level, leave in car Sin has waiting. Deliver proof of death and get paid. If things go sideways, the team will improvise. What could possibly go wrong? Shortly after 3:00 PM, Sin received a call from Kaylee, his mechanic/fixer contact. She started the conversation with the question, “Um, are you Pleiades?” Kaylee had word from another fixer that there was a job for Sin, but what the client seemed to really want was the Pleiades Group. [With the group’s average Street Cred of 5, word was getting around on the streets of a group of shadowrunners able to get any job done on the QT.] Sin and Kaylee talked back and forth and then Sin gave Kaylee The Fin’s contact number. The client stated Sin had once helped out on a run and got shot for his troubles [Everybody Needs Somebody, Session 3]. The new run was against the people who shot Sin. Mr. Johnson wanted to know if Sin wanted payback and could he bring in the rest of the Pleiades Group? The run pays low six figures and involves wetwork. 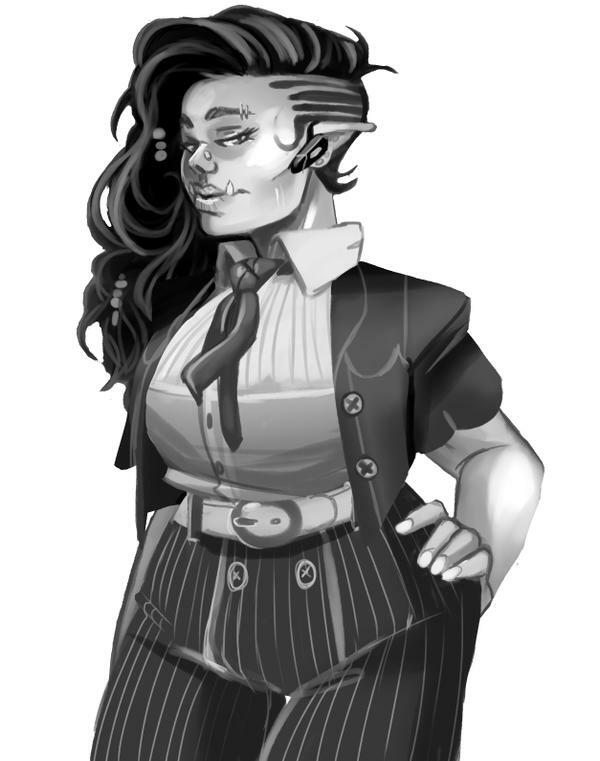 The Fin contacted the rest of the Pleiades Group, alerting them that she was going to a job meeting. She asked Void and Killroy to join her for the meeting in case she needed their expertise. Wanting to show off her new Saeder-Krupp Bentley Concordat, The Fin offered to pick them up on the way to the meeting. She drove very fast. 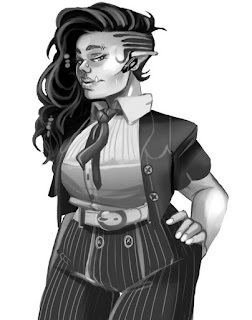 Just at 4:30 PM, the trio entered The Bawdy Lass and looked around for “a pretty orc woman dressed all fancy like.” They quickly found her sitting at a window table with a clear view of the front door. Mr. Johnson wanted a corporate working group eliminated – five individuals, zero chance of resuscitation. Pictures confirming deaths or no pay. The targets all work second shift [4:00 PM to Midnight] in the same office building and are part of an HR department. The building is high security with an experimental audio system that locks down the building if gunshots are detected. There are several HRT teams stationed in the building. Mr. Johnson has a floor plan of their offices. Expenses of up to 35,000¥ will be reimbursed. Provide an invoice after the job is done. The Fin attempted to negotiate for better pay, based on the job, but Numbers politely yet firmly shut her down – after more than 30 minutes of negotiation. [Both rolled very well on the Negotiations roll, but Numbers beat The Fin by 1 success. NEW HOUSE RULE: Negotiations last 5 minutes per common success between the parties. The time increment is flexible based on dramatic need.] Once negotiations concluded, Numbers passed The Fin a datachip and then The Fin and her companions left. The Fin contacted the rest of the Pleiades Group and told them to meet at the office soonest. Just before 6:00 PM, the entire Group was assembled at the office in the Lower Queen Anne neighborhood. The map provided was a fire escape plan map of the 12th floor of the office building at 3365 160th Avenue SE, in Bellevue, with annotations indicating which offices the targets should be in. Bookie quickly looked this address up on the matrix and discovered it was on the Federated-Boeing Bellevue campus. The entire building and all the buildings in the office park were owned by Federated-Boeing and the neighborhood was security-rated AA. Sin sent one of his drones to scout the building just before the sun set. He discovered that all the glass was heavily tinted and he could not see inside. While waiting for the sun to set, he had the drone look at the roof of the 20-story office building. He noticed a few security cameras and that the doors had keypads, Void [who was watching the video feeds from the drone] identified the locks as high-grade maglocks with keypad access, noted there were video cameras covering most of the roof, and identified motion sensors also covering the same. However, Void also noticed some gaps: the motion sensors completely missed the roof of the stairwell (being mounted around its perimeter) and there appeared to be narrow gaps between the arcs of video coverage. Bookie took this time to scout out the building’s Matrix security and access. He discovered that the outside of the building had active jammers on almost every floor. The ground floor had some public access and, snooping around, he found an access point for a host! It had the look of a fairly secure host, so he took his time attempting to sleaze his way in. After being rebuffed three times [and with an Overwatch Score of 33], Bookie decided to back off and jack out for a while. [The host had a high rating and I rolled well, repeatedly beating Bookie’s rolls by 1 or tying with him. Luckily for Bookie, the host’s ability to see him was much worse than its defenses.] He reported the high level of matrix security and suggested that he would have to be on-site to access the building’s systems. Once the sun set, Sin attempted to peek in windows, particularly those supposed to be occupied by the Group’s targets. Unfortunately, all the windows had shades and most of them were drawn, especially those their targets were supposed to be in. The best Sin could do was verify the lights were on in those offices. Meanwhile, Bookie had an inspiration on how to get either more data on the building or even access to the system: he’d go to a data haven and barter his administrative access to the Alaska Building host [gained during the Everybody Needs Somebody run] for what he needed. Now he didn’t know where any data havens were, so he contacted coldpulse [his dwarven hacker contact] to see if she knew where one was. While dubious about Bookie’s ability to make the trade, coldpulse agreed to show him where to find a data haven she knew of. She sent him some grid coordinates and told him to meet her there. The coordinates were on the Emerald City Grid, but in a low traffic area relatively near the SEATAC airport. She held up a token at an apparently empty part of the grid, which shimmered and allowed her access to a hidden area. Bookie followed her through the shimmer and found himself in the vestibule of a custom host, surrounded by Patrol IC modified to look like some sort of old-time French Legionnaires or something – Bookie wasn’t exactly certain. Still holding up her token, coldpulse let the Patrol IC scan it before telling them Bookie was with her. They let her – and Bookie – pass, resuming their patrol of the vestibule area. Bookie and coldpulse then walked into the next area of the host. Bookie discovered that the interior of the host was all in black and white and set up to look like a bar or lounge. Everyone in the place was dressed in period clothing from the early 20th century and there was a band playing ragtime music. Bookie and coldpulse changed the appearance of their icons to match the décor before coldpulse led Bookie around the seating area to a set of doors on the left side of the area, where a bouncer stood. The bouncer questioned why they were there and coldpulse responded that Bookie had data to trade. The bounced looked questioningly at Bookie, but let the two of them through the door. The area beyond was an old-style casino with roulette wheels and baccarat tables. Sitting at a table by himself on a raised area was a human male playing a game of chess against himself. Bookie was led by coldpulse towards the man, who looked vaguely familiar to Bookie. [One Memory Check later…] Bookie suddenly realized why the whole place seemed familiar – he’d seen it before in an old 2D movie! He was in Rick’s Place! [He didn’t make the roll so well as to remember the place’s actual name.] Looking and sounding exactly like Humphrey Bogart, Rick asked what the two of them wanted. Bookie stated he had data he wanted to trade and Rick offered him a seat while coldpulse went to go play some roulette. Bookie explained he was willing to supply administrative access to the corporate host of the Alaska Building. In exchange he was looking for the blue prints and security data for the office building at 3365 160th Avenue SE, in Belleview. Rick pulled out a small booklet from inside his dinner jacket and flipped through it before looking back at Bookie with raised eyebrows. “Administrative access to a minor building host in exchange for the security details on the Federated-Boeing Research and Technology Building? Well aren’t you special.” Negotiations commenced. Bookie was able to negotiate for notated floorplans and security schematics for the ground floor, the roof, and the 12th floor, housekeeping access codes for the roof, and the locations of all six HRT teams in the building in exchange for the host access codes for the Alaska Building. [Bookie rolled well for him, Rick…not so much.] Rick made a separate offer of a single valid housekeeping badge that would grant access to the parking garage and the housekeeping entrance on the ground floor, valid until March 1st, for 5000¥. Bookie made that deal as well, arranging for delivery in one of his drop boxes. When Bookie asked if there was anything Rick might want from inside the building, Rick replied, “If you pick up anything good, come see me. If you don’t, that’s OK too, just don’t let anyone know where you got the goods.” He then pulled a token out a drawer in the table top and handed it over to Bookie, it was a black pawn. “And that’ll let you in next time.” Bookie thanked Rick and left, picking up coldpulse on the way out. She asked if there was any work, clearly hinting she was available for a job. Bookie deferred, saying, “Not right now. Maybe later.” That seemed to satisfy coldpulse. Once he jacked out, Bookie provided the data to the Group. Void was not enthusiastic about what data he was able to get, but accepted it as better than nothing. The roof schematics confirmed there was a blind spot on top of the stairwell and gaps between the security cameras. The actual access code to the keypad was OK, but Void was certain she could pick the lock faster than Bookie could type the code in. The 12th floor schematics paid out better, as they included the location of motion sensors in the halls and where a HRT team was stationed on the floor [in an area marked “ELEC RM.” on Mr. Johnson’s map.] It also notated that the office suite on the opposite side of the building from their targets was the Legal department, which might be useful. The schematics also showed that there were metal shutters ready to drop down on the outside of the building if security shutdown was triggered. Finally, the data located HRT teams on the 2nd, 7th, 12th, 17th, and 20th floors, with a sixth team in ‘Basement 3”. There was no indication of how the HRT teams were armed or augmented. However, with the knowledge that they worked for the same corporation as the security team Sin (through the liberal use of Susan, his drone tank) had fought previously [back in Everybody Needs Somebody], they could get an idea by asking Svetlana, The Fin’s Vory contact who “processed” the bodies for the Group. The Fin made note to contact Svetlana shortly. Murdoc decided now would be a good time to astrally project [for the first time] and check out the target building for magical defenses. He started by checking the building in general and discovered only certain areas on certain floors were warded, not the entire building. Locating the 12th floor, he entered it from the side furthest from the targets. In the Legal department he found one tired and cranky mundane person working away. A couple of filing cabinets were warded, but that was it. He pushed into the center foyer of the floor and perceived that the waiting area for the HRT team on the floor was warded. Murdoc immediately fled the building, taking the time and effort to obscure where he was going in case of pursuit. Once he finally returned to his body, Murdoc reported what he had learned, downplaying the fact that he’d been spotted. With the information provided by Murdoc, the rest of the team was able to assign office locations for Althea Leafhawk (office 5, in the corner) and Lakeisha Erickson (office 1). Marie Chang was most likely the person in office 4 and who was Awakened instead of having bioware [clearly the notes from Mr. Johnson botched that]. That left Dexter Baldwin and Jasper spears in offices 2 and 3 with no immediate way to determine which was which. How bad could it be? UPDATED: Session 1 has been posted. The run will be fairly simple and straight forward, but with the usual Shadowrun "here's the job, you figure out how to do it - oh, and hurry up if you want to get paid" complications. If it was easy, Mr. Johnson would do it himself, not hire some deniable assets who might get killed trying. You know how Mr. Johnson is. Running this campaign has been a learning experience by design. Most of the group had not played Shadowrun before and those that had played previous editions. We've stuck with the Core Rules only as Shadowrun has lots of moving parts. I cheated once to pull in the succubus spirit in for one run (to great effect), but for the most part if it isn't in the Core Rules, it wasn't used. This has helped us come to grips with the game in manageable chunks. This has also lead to some grey areas as there are gaps in the Core Rules that are supposed to be filled in by the splat books (Chrome Flesh, Data Trails, etc.). I've consulted with a fellow GM who has run SR5 for his own group, which has helped, but sometimes there is no good answer (for example, how much does IC cost if a player has access to a host and wants to install some?). It has also occasionally unearthed a noticeable difference between SR5 and previous editions (data bombs are much more dangerous from what I remember). I've been very satisfied with SR5 overall. It limited the more comic book-y elements by adding in limits without removing the ability of player characters to do cool things. Each character archetype shines in its own environment and each is jonesing for a different resource. At some point, we will be re-spec-ing characters, using all the splat books. I need to read through them to determine if there is anything I don't want to include and from what I hear, there is stuff in Data Trails I may not want to use (growing hosts from the Matrix like something organic? Really?). I think we are starting to get a good grasp on the Core Rules now, so I'm looking for a good story point to suggest a switch over to the other co-GM, but I'm not in a hurry.